Per email received from Emily Woodrow: The campaign website of Judge Maureen Ward Kirby, candidate for the Healy vacancy. Judge Kirby now holds that seat pursuant to appointment by the Illinois Supreme Court; Ms. Woodrow is her campaign manager. I've added this link to the list of candidate websites in the Sidebar. If you know of a candidate website that is not listed in the Sidebar, please send me an email. Cook County a "Judicial Hellhole"? The American Tort Reform Foundation (ATRF) has published a new report labeling the Circuit Court of Cook County as a "Judicial Hellhole." The report has become an annual event; Madison and St. Clair Counties in downstate Illinois have been recipients of this dubious honor in prior years. The ATRF report defines "Judicial Hellholes" as "places where judges systematically apply laws and court procedures in an unfair and unbalanced manner, generally against defendants in civil lawsuits. The jurisdictions discussed in this report are not the only Judicial Hellholes in the United States; they are merely the worst offenders. These cities, counties or judicial districts are frequently identified by members of the American Tort Reform Association (ATRA) and individuals familiar with the litigation." 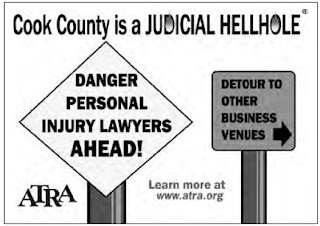 "Judicial Hellhole" is such a catchy phrase that it has been registered as a trademark of ATRA; the use of the terms was licensed to ATRF by ATRA for its attack on Cook County and the other jurisdictions slammed in the current report. ATRA, according to its website, "was co-founded in 1986 by the American Medical Association and the American Council of Engineering Companies." So: What does ATRF offer in support of its contention that Cook County "judges systematically apply laws and court procedures in an unfair and unbalanced manner, generally against defendants in civil lawsuits?" ATRF cites three reasons (pp. 9-11). First, "Trial Lawyers Cash in on Grief." Second, a "Cook County Judge Throws Out Illinois Medical Liability Reform." Third, a "Mixed Bag of Excessive Verdicts." The first charge refers to an amendment passed this year to the Wrongful Death Act, 740 ILCS 180/1 et seq. Section 2 of the Act was amended to permit juries in such cases to consider, as elements of damage, the "grief, sorrow, and mental suffering" of "the surviving spouse and next of kin of the deceased person." One might construct a reasoned argument that this amendment will have adverse consequences for Illinois businesses. One might even ask why the legislature found itself able to meddle with the Wrongful Death Act when it could not pass a budget and still can not pass mass transit relief. But even accepting that many of the sponsors of the amendment were from Cook County, how can this legislative action be used to besmirch the reputation of the hundreds of judges sitting in Cook County? When last I heard, trial judges have an obligation to apply the laws of this State as written, whether the laws are wise or foolish, so long as the laws are constitutional. Is ATRF against this? Maybe it's against judges determining constitutional challenges... at least that's one way of understanding ATRF's second objection, that "a Cook County court has invalidated a state legislative limit on potentially infinite pain and suffering awards in medical malpractice cases." I have not carefully studied the most recent cap statute or Cook County Circuit Judge Diane Joan Larsen's opinion finding that statute wanting; for that reason I venture no opinion on whether Judge Larsen called it right or wrong... but caps statutes have twice before been invalidated by the Illinois Supreme Court. Surely ATRF would expect judges to follow precedent in reaching decisions, right? And even if -- even if -- Judge Larsen was entirely off base in her ruling, how does that one ruling show, generally, that Cook County "judges systematically apply laws and court procedures in an unfair and unbalanced manner, generally against defendants in civil lawsuits?" The last and final reason why ATRF says Cook County is a "Judicial Hellhole" is that there were some very large verdicts in Cook County this past year. Some anecdotes are shared. Why the verdicts in the particular cases were large is largely not addressed. 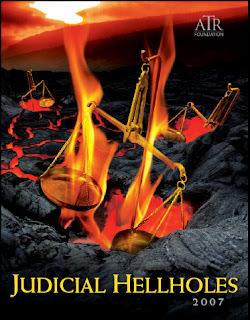 ATRF asks what makes a "Judicial Hellhole" -- and answers its own question this way (p. 1): It's the judges. "While most judges honor their commitment to be unbiased arbiters in the pursuit of truth and justice," the report says, "judges in Judicial Hellholes do not. These few judges may simply favor local plaintiffs’ lawyers and their clients over defendant corporations." This is an extraordinary charge. But the gaudy charges against the Cook County judiciary are unsubstantiated by the ATRF report. If the ATRF report were a lawsuit, it might be sneered at as frivolous litigation. Accompanying illustrations taken from the ATRF report. Per email received from the candidate: The campaign website of Judge Marilyn F. Johnson, candidate for the countywide Keehan vacancy. (Johnson was appointed to this vacancy by the Illinois Supreme Court in March 2006.) I've added this link to the list of candidate websites in the Sidebar. If you know of a candidate website that is not listed in the Sidebar, please send me an email. Found on the Internet: The campaign website of Ursula Walowski, candidate for the Kowalski vacancy in the 10th Judicial Subcircuit. I've also added this link to the list of candidate websites in the Sidebar. If you know of a candidate website that is not listed in the Sidebar, please send me an email. You'll notice Judge Shapiro's 'in his own words' post begins with a quote from his CBA evaluation. The judicial evaluation committees of the various bar associations are working long hours to sift through the candidates' applications and complete their evaluations of the candidates' credentials. When all the evaluations are done, the bar associations will post their findings (this link, for example, will take you to the CBA results when they are available). In the meantime, however, bar associations are releasing results on a candidate by candidate basis -- but only to the candidates themselves. Some, but not all, of the candidates have their evaluations from some, but not all, of the bar associations which are doing evaluations. I will be posting the complete results from the different evaluating groups when they are released... but, in the meantime, I have something of a dilemma. I'm torn about posting this information -- and this has nothing to do with Mr. Babcock personally: I just don't know how fair it is to disclose information like this about Candidate A in a race before Candidate B gets his or her results. The bar associations do not infer or imply that Candidate A is more qualified or more highly recommended than Candidate B, if both are found "Qualified" or "Recommended," just because Candidate A's ratings are finished first. On the other hand, waiting until everyone's ratings are completed to reveal anyone's ratings will take us close to the February 5 primary date -- too close in time, perhaps, for the ratings to have the influence they might otherwise have on the voters. Thus my dilemma: I want to help candidates publicize their favorable ratings, but I don't wish to contribute to any incorrect impression that a candidate who is evaluated sooner is somehow better than a candidate who receives the same ratings but not until a later date. If you have an opinion on this subject, I would very much like to hear it. Leave a comment. James A. Shapiro is a candidate for judge in the 8th Judicial Subcircuit. "Judge Shapiro is well regarded for his integrity and fine judicial temperament." 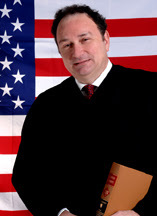 -- December 2007, Chicago Bar Association rating Judge Shapiro qualified for election to the bench. I am a sitting judge, appointed to an Eighth Subcircuit vacancy by the Illinois Supreme Court. Before my appointment, I practiced law for more than 22 years, with extensive trial experience, both jury and bench. I was an Assistant United States Attorney in Chicago, and then practiced mostly federal and state criminal defense, with a significant amount of civil litigation, for over a decade. Although I have been on the bench only since August, I previously had over ten years of quasi-judicial experience as a Hearing Board Chair with the Attorney Registration and Disciplinary Commission and as a Chair-Qualified Arbitrator for the Cook County Mandatory Arbitration Program. I have federal and state experience, civil and criminal, plaintiff and defendant, prosecution and defense, private and government practice, and have been a practitioner at big, medium, small, and solo firms. But perhaps my strongest qualifications for this position, in addition to my professional experience and knowledge of the law, are my fairness, patience, empathy and a deeply-held belief that a good judge can have a positive impact on the people who appear in his or her court. The justice system can be a faceless bureaucracy; people should be treated with dignity and respect, not as case numbers or administrative units. Judges need to remember that what is routine and mundane to the administrators and practitioners is probably totally foreign, incomprehensible and often frightening to the litigants. As a judge, I am committed to ensuring that people who appear before me understand the procedures and what is happening to them. When I first decided to study law, my main objective was to be a fighter for justice. Whether prosecuting public corruption in the U.S. Attorney’s office, defending clients in criminal court, or representing indigent victims of fraud and misrepresentation, I have felt fulfilled in that role. I have also achieved immense satisfaction from my scholarly pursuits as professor, lecturer, and author. I have authored or co-authored law review articles on federal sentencing and federal tort claims which have been cited in cases, law school casebooks, other law review articles, and treatises. During the 1990s, I taught legal writing at Loyola, and from 1993-2003 I was a guest lecturer at Chicago Kent, teaching federal plea negotiations. Since 2003, I have been an Adjunct Professor at John Marshall, teaching Federal Courts. My teaching experience also includes lecture tours in 1999 and 2000, speaking on American criminal justice issues at the German-American Institutes in Freiburg, Tübingen, Heidelberg, Munich, Nuremburg, and Stuttgart, Germany. I love the law - teaching it, arguing it, writing about it - and have relished it in all its manifestations throughout my career. Serving as a judge is yet another aspect of its practice, one I have grown into through experience and which I now am honored and privileged to enjoy. Per email received from Aviva Patt, Campaign Manager for Judge James A. Shapiro, candidate for the Sheehan vacancy in the 8th Judicial Subcircuit: Campaign website of James A. Shapiro. I've also added this link to the list of candidate websites in the Sidebar. If you know of a candidate website that is not listed in the Sidebar, please send me an email. Assistant State's Attorney Maureen Leahy Delehanty withdrew Friday, December 21 as a candidate in the 3rd Subcircuit race. Judge Patrick J. Sherlock, appointed to the Donnersberger vacancy by the Illinois Supreme Court, will now hold that seat by default. Found on the Internet: the campaign website of Paula M. Lingo, candidate for the Murphy vacancy. I've added this link to my list of judicial candidate websites in the Sidebar. If you know of any other Cook County judicial candidate website that is not listed in the Sidebar, please send me an email or leave a comment. When accused of drunk driving, it may be best to come clean -- but not the way an 18 year old man did recently in Wisconsin, according to this UPI story posted December 17. According to the UPI story, a reserve officer in the Fond du Lac County Sheriff's Department stopped the drunk driving suspect near a gas station, but the suspect decided to flee. His chosen escape route, however, took him through the gas station's car wash. This was not the right way to come clean. A Fond du Lac police office who'd stopped to help was nearly run over as the suspect's vehicle came careening out of the car wash, but, according to this Canadian Press story, the driver was apprehended four miles down the road after a "tire deflation device" was used to stop the car. The driver was reportedly Tasered at the scene. It is not reported whether the driver, who was not named in either linked account, responded with this year's most memorable quote, "Don't tase me, bro!." From the Times Herald-Record, a newspaper serving New York's Hudson Valley, this story about Lance Majors' day in court: On December 13, according to Victor Whitman's article, Lance Majors, 38, of Poughkeepsie, New York, appeared before Judge Frank LaBuda for sentencing on drunken driving and other charges stemming from a March 24, 2007 incident in which he was clocked at a speed of "107 mph with his 11-year-old daughter in the passenger's seat." There may not be very many helpful things a person might say under similar circumstances. The remarks attributed to Mr. Majors on this occasion, however, must be ranked among the least helpful. According to the article, Majors told Judge LaBuda that he "expected no justice from a man with a reputation for sarcasm in court." Then, Whitman writes, Majors "shook his head and laughed out loud." But this was not all: As sentence was being pronounced, Majors told the judge, "Just speed it up because you are really boring me." For the record, Judge LaBuda sentenced Majors to a prison term of 2⅓ to 7 years on the felony drunk driving charges and to the maximum sentence allowed "on six counts, including charges for reckless endangerment, driving with a revoked license, endangering the welfare of a child and speeding." For good measure, Judge LaBuda tacked on an additional 15 days for contempt of court. "Laugh all you want to, Mr. Majors," the judge said. Whitman reports, "Majors has five prior convictions for DWI, and has been convicted for a string of crimes, including a robbery and the possession and sale of drugs." Majors represented himself in the three day jury trial that led to his convictions. Per email received today: Candidate website of David H. Latham, candidate for the Young vacancy in the 7th Subcircuit. I've also added this link to the list of candidate websites in the Sidebar. I learned this week of a couple other candidate websites that are in development; I expect to post these soon as well. If you know of any Cook County judicial candidate website that is not listed in the Sidebar, please send me an email or leave a comment. The Fraternal Order of Police, Chicago Lodge No. 7, has announced its endorsements for the February 5, 2008 Cook County judicial primary. The FOP chose to make endorsements in all but one countywide race. It also made endorsements in the Sixth, Eighth and Tenth Subcircuits. The Fraternal Order of Police, Chicago Lodge No. 7, is the union which represents Chicago police officers below the rank of Sergeant. For What It's Worth now has a second page: That's where you'll find the judicial ballot for the February 5, 2008 primary -- vacancy by vacancy, in ballot order. Only five names on page two have links back here to "In Their Own Words" posts as this is written -- but as each new "In Their Own Words" post is received, a link will be added. And, of course, the essay will be posted here, on page one. The goal is simple: Every Cook County judicial candidate would submit an essay. Voters will be able to visit page two, click on a race in which they are interested and read each candidate's essay (clicking back and forth using the back arrows on their browsers) and thereby make informed choices. Absentee ballots will be available soon after Christmas; early voting begins in mid-January. I'm hopeful, therefore, that candidates will submit their essays as soon as possible. Thomas Francis Biesty is a candidate for the Pucinski vacancy in the 10th Judicial Subcircuit. During my career, I have witnessed our laws in action from many points of view. From enforcing the law on the street, to upholding the law in the courtroom, and even teaching it in the classroom, I have participated in almost every aspect of our legal process. My passion for the law, commitment to public service and strong ethics make me the ideal candidate for Judge of the Circuit Court 10th Judicial Subcircuit to fill the vacancy of the Honorable Aurelia Pucinski. My first taste of the law was as a young police officer on the streets of New York. As a rookie cop I was assigned to some of the roughest areas of the city including Harlem and the South Bronx. The challenges and frustrations of working in these areas were offset by the realization that enforcement of the laws fairly and consistently helped improve the lives of the many working class residents struggling to survive in these terrible conditions. During my years on the job, I earned awards and commendations for exceptional police work, but my job satisfaction came from doing my job and making my "beat" a safer place to live. Upon graduation from law school, my commitment to public service brought me to the Cook County State's Attorney's Office where I have investigated and prosecuted some of Chicago’s most vicious killers and criminals over the last 16 years, including Daniel Escobedo, Kenneth Hansen and Frank Jayne to name a few. Most recently, as Supervisor of the Cold Case Squad, I successfully prosecuted the well-known Brown's Chicken Massacre defendant Juan Luna. Not only was this case complex, it was the first high profile death penalty case after capital litigation reforms. While this case was 14 years old, and extremely challenging, justice was served and the case was closed. Day to day, I supervise a team of eight attorneys and four investigators that specialize in developing strategies to solve "cold case" homicides (more than one year old). I regularly manage investigations among various law enforcement agencies while applying new methods and scientific technology to solve these crimes. The success of this unit over the last several years has lead to almost 100 closed cases. We have successfully prosecuted murders from 1955 to the present and I take great pride in the fact that justice has been served in cases that had been previously unsolved. Before working in the Cold Case Squad, I was assigned to the Gang Prosecutions Unit. While there, I was assigned to prosecute and investigate gang leaders and gang members. Additionally, I was cross-designated as a Special Assistant United States Attorney for the Northern District of Illinois. During my tenure, we successfully prosecuted and dismantled a notable violent street gang. Through out my career as a practicing attorney, I have had the honor and privilege of teaching law students and coaching less-seasoned lawyers. I have guest lectured at John Marshall School of Law and DePaul School of Law. Additionally, I have taught various courses at the National College of District Attorneys, taught at the Capital Litigation Training for the State Appellate Prosecutor and was an adjunct professor at Triton College for five years. These classroom experiences afforded me the opportunity to share the realities of the criminal justice system with my students from various perspectives. In addition to my professional qualifications, it should be noted that I have already rated qualified or recommended from most Bar Associations (see website www.electbiesty.net). My legal experience is complimented and balanced by my community involvement. Over the last four years, I have been a basketball and baseball coach for the Chicago Park District and local Little League. Additionally I am an active member of my community association. Likewise, I have given back to the legal community when I was a member of the Chicago Bar Association Judicial Evaluation Committee for six years and for four of those years I was the Vice Chair of the Judicial Evaluation Community. While I am unsure whether any of the other candidates in my race can claim all of the above endorsements, I am confident that no other candidate has the experience, passion or the various perspectives of our legal system that I have. If I am elected Judge, I will be fair and impartial, treating all parties equally under the laws of our state. Found on the Internet: The campaign website of Judge LaGuina Clay-Clark. I've also added this link to the list of candidate websites in the Sidebar. Judge Clay-Clark was appointed by the Illinois Supreme Court to the Turkington vacancy in the 1st Judicial Subcircuit; she's running against Donna L. Cooper and Zedrick T. Braden III in an effort to keep this seat. In part one of this look at the current status of the countywide judicial races in Cook County, we covered the Disko and Glowacki vacancies. In part two, we looked at the Healy, Keehan, and Lott vacancies. In part three, we looked at the Montelione, Murphy, and Nowicki vacancies. That leaves only the Thomas vacancy. E. Madeline O'Neill has been an attorney since 1980, and, according to ARDC, was recently employed by the Chief Judge's Office at the Cook County Juvenile Courthouse. As Eleesha Madeline O'Neill, O'Neill ran for judge in the 6th Subcircuit in 1994 and filed again in 2006. She would have faced off against Gloria Chevere in the race for the "A" vacancy, but was not on the primary ballot. I wrote about O'Neill in this earlier post because O'Neill also filed, initially, for the 6th Subcircuit vacancy. In response to that post, I received this comment from "fedup dem": "For the record, O'Neill is one of 14 Hearing Officers who were 'rewarded' in March for years of dedication and hard work in reducing the backlog of cases in the Child Abuse and Neglect Division of Juvenile Court by being fired in the round of layoffs." I don't pretend to vouch for the information provided by "fedup dem," but I repeat it here in the expectation that it will promptly be contradicted if untrue. Joan Powell is the slated candidate of the Democratic Party for this vacancy; she has also been endorsed for this vacancy by the Chicago Federation of Labor. She was appointed to this vacancy by the Illinois Supreme Court. Abdon M. Pallasch's September 17 Chicago Sun-Times article about this year's slating noted that Powell is the "wife of Democratic political strategist Phil Krone." Before going on the bench, Powell was an Assistant State's Attorney. David John Mulvihill (Objection Pending) is a senior attorney in the Legal Department of the LaSalle Bank Corporation. He's been an attorney since 2000. Patrick Dennis Riley (Objection Pending) ran for the Saylers vacancy in 2004. A lawyer since 1988, Riley is a solo practitioner with offices downtown. This concludes our sketches of the countywide judicial candidates in Cook County. In putting these sketches together, I've used the "Illinois Newspaper" database in Westlaw, the ARDC website, the State Board of Elections website, Sullivan's Law Directory, and Yahoo! and Google searches. Candidate websites, where known, were consulted. In a few cases, candidates sent information to me. Some of these pieces are longer and more detailed than others. Some candidates, because of the jobs they have held, have had more public exposure: Thus, more information is available. However, that more is known about Candidate A than Candidate B does not automatically mean that Candidate A would make a better judge. This is one of the reasons why I've offered every judicial candidate in Cook County the opportunity to state their own case for election -- to place before the voters their own credentials, in their own way, and in their own words. That link will take you to my offer. Since I first made the offer, some candidates have indicated concern about the suggested 500-word limit: Let me state again that I'll run what the candidate asks... but I suggest that anything too far in excess of 500 words will look too long on this narrow page and may turn off prospective voters who may "comparison shop" among candidates. I'll run the candidates' statements upon receipt. A couple of weeks before the primary, I'll set up posts in ballot order. Any candidate who has submitted a post 'in their own words' will find their name linked to that post. Thus, a voter can click back and forth from the 'sample ballot' to the candidates' own statement... and make informed decisions about judges in Cook County on February 5, 2008. In part one of this look at the current status of the countywide judicial races in Cook County, we covered the Disko and Glowacki vacancies. In part two, we looked at the Healy, Keehan, and Lott vacancies. As we move along in this survey, we move further down the ballot. We resume here with the Montelione vacancy. Debra B. Walker (Objection Pending) is a partner with the firm of Clausen Miller PC. She was a finalist in the most recent round of Associate Judge selection. Walker was President of the Women's Bar Association of Illinois in 1998-99. A C.P.A. as well as a lawyer, Walker's Clausen Miller biography reports that Walker has "was recently appointed to the Illinois Supreme Court Commission on Professionalism and to the Board of Directors of the Illinois Bar Foundation." Senator Richard Durbin appointed Walker to his nominations commission. Walker is also a past president of the North Michigan Avenue Business and Professional Women’s Network. She was recently endorsed for this vacancy by the Chicago Federation of Labor. Thaddeus L. Wilson is the candidate slated by the Democratic Party for this vacancy. He was appointed to the bench by the Illinois Supreme Court in August of this year. Before going on the bench, Wilson was the law partner of 21st Ward Ald. Howard B. Brookins, Jr. A South Carolina native, Wilson received his Bachelors degree in 1989 from the University of Notre Dame. He worked initially as a computer programmer/systems analyst at Joseph T. Ryerson & Son before taking his law degree in 1994. He's also served as a hearing officer for the Chicago Board of Elections. Thomas A. Doran (Objection Pending) is an Assistant Corporation Counsel in Chicago. He's been a lawyer since 1992. 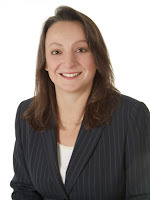 Kristyna Colleen Ryan (Objection Pending) has been a lawyer with Childress Duffy Goldblatt Ltd. She's been a lawyer since 2000. Paula M. Lingo is the slated candidate for this vacancy. She ran for the bench before in 2000, in the 5th Subcircuit. She is currently Chief Legal Counsel to Eugene "Gene" Moore, Cook County Recorder of Deeds. Lingo has been a lawyer since 1977. Frank James Ryan (Objection Pending) has been a lawyer since 1981. He practices with Ryan and Ehrenstrom in Oak Forest. Brian Terrence Sexton is the supervisor of the gang unit in the State's Attorney office. He's been a lawyer since 1987. Kim R. Kardas is a solo practitioner in the Loop. Formerly with Belgrade & O'Donnell, Kardas has been an attorney since 1980. According to the November 15, 2007 Chicago Daily Law Bulletin,John J. "Jack" Murphy "is the younger brother of 1st District Appellate Justice Michael J. Murphy and Circuit Judge Patrick T. Murphy." A lawyer with Scariano, Himes and Petrarca, Murphy is a member of the Glenview School Board. Michael B. Hyman is the slated candidate of the Democratic Party for this vacancy. (The preceding link is to Hyman's "In His Own Words" post on this blog; what follows is a link to his campaign website.) Judge Hyman was appointed to this vacancy by the Illinois Supreme Court in June 2006, shortly after he completed his term as President of the Chicago Bar Association. Before going on the bench, Hyman was a partner at Much, Shelist, Freed, Denenberg, Ament & Rubenstein, P.C., concentrating in antitrust, securities fraud and consumer fraud matters. He recently received the endorsement of the Chicago Federation of Labor in this race. Kim L. Sorrells (Objection Pending), a lawyer since 1988, is an Assistant Public Defender, based in Markham. Mary McDonagh-Faherty (Objection Pending). According to the Cook County Clerk's website, this objection was sustained but, as of Sunday evening, the State Board of Elections still shows her as an active candidate. In part one of this look at the current status of the countywide judicial races in Cook County, we covered the Disko and Glowacki vacancies. We resume here with the Healy vacancy. 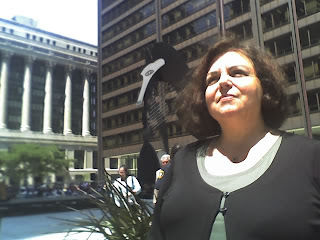 The Illinois Supreme Court appointed Maureen Ward Kirby to this vacancy in August 2007; she has since been slated for this vacancy by the Democratic party and endorsed by the Chicago Federation of Labor. Before August, Kirby was a partner with Bell, Boyd & Lloyd LLP. About 10 years ago Kirby represented Northwestern football player Darnell Autry in a case against the NCAA, trying to get the NCAA to let Autry (who had aspirations of becoming an actor) appear -- without pay -- in a movie. Peter John Curielli (Objection Pending) has been a lawyer since 2000. He has an office in Barrington. 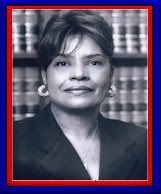 Judge Marilyn F. Johnson was appointed to this seat by the Illinois Supreme Court. The Democratic Party slated her for this vacancy and the Chicago Federation of Labor has endorsed her candidacy. Johnson was General Counsel for the Chicago Public Schools until 2003, when she became Chief of Staff of the Illinois State Toll Highway Authority. Johnson briefly succeeded Jack Hartman as Executive Director of the Tollway Authority in 2006 but accepted appointment to the bench instead. As Giuseppe R. "Joe" Papavero, Joseph Robert Papavero (Objection Pending) ran as a Republican in the 12th Subcircuit in 2006. A lawyer since 2000, the ARDC's website lists Papavero's employer as Community Investment Corporation. Joanne Marie "Jody" Rogers practices with Ellison Nielsen Zehe Antas. According to the firm's website, Rogers practices in civil rights, insurance subrogration, insurance malpractice, property & casualty, and personal injury - defense. An attorney since 1989, Rogers ran for a countywide vacancy once before, in 1998. Thomas J. Byrne is the candidate slated by the Democratic Party in this race. He also received the endorsement of the Chicago Federation of Labor. Byrne is a supervisor in the Cook County state's attorney's office in the 3rd Municipal District at Rolling Meadows. He ran for the Schiller vacancy in 2006, finishing second behind Pamela E. Hill Veal. Byrne won the Tribune endorsement in 2006, however. The Tribune editorial said, "In 16 years as a prosecutor Thomas J. Byrne has handled more than 1,000 cases. He supervises the prosecutors assigned to the Rolling Meadows courthouse. He works with police to evaluate felony cases, and his peers have praised him for having the courage to make and defend unpopular decisions about what would be appropriate criminal charges." The countywide races for seats on the Cook County bench have narrowed considerably since the filing period closed on November 5. Many would-be candidates have dropped out -- some voluntarily, some because objections to their campaign petitions were sustained and they were found ineligible for the ballot. In some races, the field has narrowed to the point that there may be actual 'head to head' match-ups. We'll start the round-up of where the countywide races stand now with the Disko and Glowacki vacancies. Candidates listed in ballot order. You'll note that, in some cases, the candidate's name is followed by the words "Objection Pending." That only means that a petition challenge has been made -- but it does not mean that the challenge will or will not be successful. To follow the status of petition objections, click here. Lauretta Higgins Wolfson is the candidate slated by the Democratic Party for this vacancy. She was appointed to this seat by the Supreme Court and is married to First District Appellate Justice Warren Wolfson. Wolfson was recently endorsed by the Chicago Federation of Labor for this vacancy. Dennis J. Burke (Objection Pending) is also a sitting judge, appointed by the Supreme Court to the Murphy vacancy. The Cook County Democratic Party, however, chose Paula M. Lingo for that seat instead. Judge Burke (who had to step down as Associate Judge to accept appointment as a full circuit judge) was chosen to be a fourth alternate by the Party. That meant that he would automatically have become the candidate of the Democratic Party if four additional seats opened up... but not even one did. Sharon Finegan Patterson (Objection Pending) is making a second bid for the bench, finishing third in the 2006 Primary to Pamela E. Hill Veal in the race for the Schiller vacancy. Patterson has a solo office in the Loop; she's been a lawyer since 1980 and, according to her Sullivan's entry, practices in the areas of commercial litigation, employment disputes and personal injury. Associate Judge Jesse G. Reyes is the Democratic Party's slated candidate in this race. Judge Reyes went on the bench in 1997; he recently served as President of the Illinois Judges Association. In April of this year, Reyes was the recipient of the 2007 Justice Anthony Scariano Award, presented by the Justinian Society of Lawyers for his work advancing the interests of Italian-Americans, minorities and women in the legal profession. 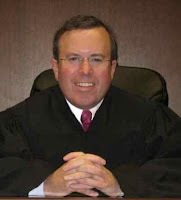 Judge Reyes has received wide acclaim for his work collecting childrens' books and distributing them to needy families. Before going on the bench, Reyes served as an Assistant Corporation Counsel for the City of Chicago and as an attorney for the Chicago Board of Education. Terry MacCarthy's website touts his 12-year membership in AFSCME. That may have figured in the the decision by the Chicago Federation of Labor to endorse MacCarthy in this race. MacCarthy is an Assistant Cook County Public Defender and has been a lawyer since 1990. Luther Franklin Spence (Objection Pending), a lawyer since 1975, has his office in Maywood. He does criminal defense and personal injury work. Per email received today from Dalila Fridi: Campaign website of Rosaire Marie Hall, candidate for the Morrissey vacancy in the 10th Subcircuit. I've also added this link to the list of candidate websites in the Sidebar. If you know of a candidate website that is not listed in the Sidebar, please send me an email. I'd like to list every Cook County judicial candidate with a campaign website in my Sidebar. If you know of a link, send an email or leave a comment. Also, every Cook County judicial candidate is invited to submit an essay (approximately 500 words) advising why he or she is the one voters should select on February 5. For more about this, click here. Four candidates have already participated; I know others that have been promised. To read the posts submitted so far, click on the "In Their Own Words" label at the bottom of this post. Robert Saldon, 50, of Somerset County, Pennsylvania, reported his truck stolen on Thanksgiving night. When police arrived, they took him into custody. According to this AP story posted late yesterday on Yahoo! News, Conemaugh Township police pulled Saldon over earlier that night because of a broken taillight on his truck. Saldon got out of his truck, but didn't wait for a ticket -- he ran away. When Saldon got home, he shaved off his mustache and changed clothes. Then he called police and reported that his truck had been stolen. Apparently, there aren't that many officers working for the Conemaugh Township Police Department, particularly on holiday evenings, so the same officer who was left in the dust at the traffic stop was dispatched to take the report. He was not fooled by Mr. Saldon's disguise. Kirk Swauger's story for the Johnstown, Pennsylvania Tribune-Democrat provides a possible explanation for Saldon's behavior. According to Swauger's story, Saldon had been arrested for DUI on a couple of prior occasions; he may not have been entirely sober on this occasion either. Swauger reports that Saldon was charged with drunken driving and escape, and also "with illegally operating a vehicle without a court-required ignition interlock system to stop habitual drunk drivers; resisting arrest; careless driving and two summary violations." Oh, and another reason why the disguise didn't work? When Saldon shaved, there remained a "pale outline of the just-removed facial hair on his wind-reddened face." According to this story, posted today on Yahoo! News, a court in Naples, Italy issued summonses to Tweety Bird, Mickey Mouse, and Donald and Daisy Duck. The summonses were issued in connection with a criminal trial of a Chinese man accused of counterfeiting Disney and Warner Brothers products bearing the likenesses of the aforementioned rodent and his feathered friends. Ariel David's story for the Associated Press explains it was all a clerical error: "Instead of naming only the companies and their legal representatives, clerks also wrote in the witness list the names of the cartoons that decorated the toys and gadgets the man had reproduced." Cristina Ravelli, a Disney lawyer, says the trial will probably be continued while summonses are rewritten. Per email received this morning, a fundraiser will be held for Judge Thaddeus L. Wilson on December 11, 2007, from 5:00 to 7:00 p.m. at the Midtown Kitchen + Bar, 203 N. LaSalle Street, in downtown Chicago. Ticket prices for the event run from $50 each (the "Patron" level) to $1,000 (the "Supreme" level). Other levels of support are the $100 "Friend" level, the $250 "Bailiff" level, the $500 "Circuit" level, and the $750 "Appellate" level. 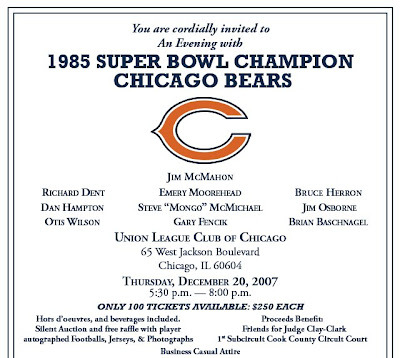 For additional information regarding Judge Wilson's fundraiser, call (312) 360-0888, ext. 203 or email the Committee to Elect Thaddeus L. Wilson at committee@thaddeusforjudge.com. 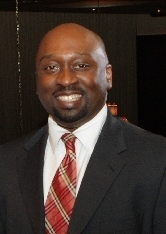 Thaddeus L. Wilson is the slated candidate for the countywide Motelione vacancy. He was appointed to the bench by the Illinois Supreme Court in August of this year.